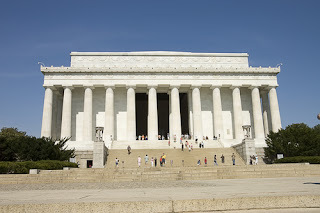 The "I Have a Dream" speech is such a part of the Lincoln Memorial story, that the spot on which King stood, on the landing eighteen steps below Lincoln's statue, was engraved in 2003 in recognition of the 40th anniversary of the event. If you do visit the Lincoln Memorial, the National Park Service does daily programs about the "I Have a Dream" speech at 1 p.m. and 5 p.m. daily. And it's worth noting that women had no speaking role on the day of the "I Have a Dream" speech, although prominent women from the civil rights movement like Rosa Parks were present. Martin Luther King, Jr.'s speaking continues to inspire the speakers of today, as this TED Talks compilation shows--there are links so you can listen to his "I have a dream" speech as well as speeches inspired by him. Labels: famous speeches, Martin Luther King Jr.